Sony announced that it is building up a massive 16K screen with its Crystal LED technology in Japan at National Association of Broadcaster 2019. 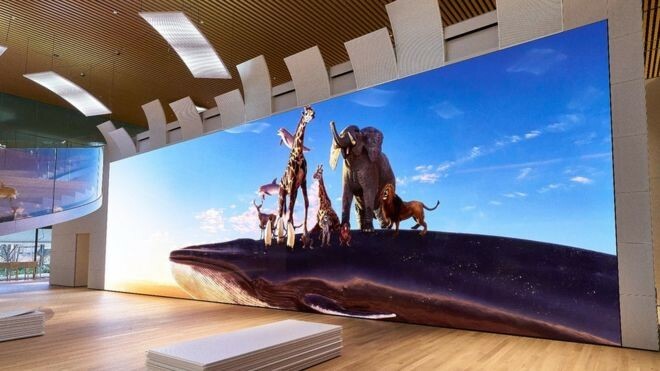 The size of the giant TV screen is 19.2 meters by 5.4 meters (63 ft by 17ft) with an ultra-resolution of 16K, which uses 16 times the pixel of 4K TVs and 64 times more than 1080p. Sony is currently installing the screen in Yokohama, Japan, for a new research center of Shiseido, the Japanese cosmetic group. Sony’s Micro LED technology, called “Crystal LED” by the company, is adopted for the 16K TV screen. With the technology, Sony builds the immense screen by splice multiple panels seamlessly. According to BBC’s report, Sony used a method named “demosaicing” to achieve “quad ultra-high definition” footage. However, Sony did not reveal further details of its technology.